More than half of Starbucks customers surveyed by UBS say they would find another Starbucks if their local store were to close. The bank says Starbucks is “still a star” when it comes to US coffee, and can return to healthy same-store sales levels this year. 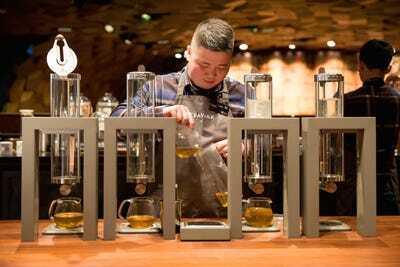 Caffeine addicts aren’t showing any signs of giving up their beloved Starbucks, according to new research from UBS. 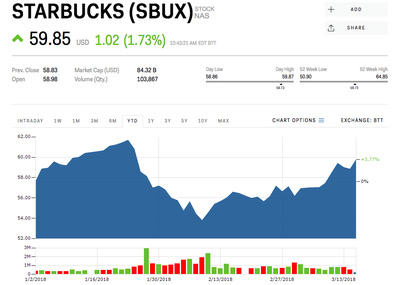 The Swiss bank says the chain is “still a star” in the US coffee category, and has raised its price target yet again for Starbucks, from $US64 to $US66 – 10% above where the stock was trading Thursday morning. “Our 2nd annual UBS Evidence Lab coffee survey of >4,000 global and ~700 US respondents highlights Starbucks’ strong brand equity, including favourable scores on factors most important to coffee drinkers,” analyst Dennis Geiger said in a note to clients Thursday. In its most recent earnings report, Starbucks reported same-store sales – a closely watched metric for restaurant investors – of just 2%, which sent the stock sliding as much as 12% over the following two weeks. It has since recouped most of those losses. UBS thinks the chain can get its same-store sales back up to healthier levels. “We expect sss can reach 3% in the F2H18, reflecting favourable brand scores, improved operations, better afternoon performance, & increasing digital contribution,” the bank said. Starbucks is up 3.8% so far in 2018.